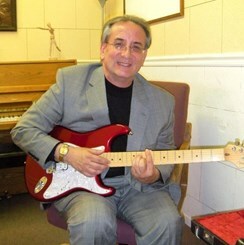 Mark DeAngelis taught music lessons at Milano Music from 1970 to 1980. Mark started his music career at the age of ten and within two years he was playing guitar in bands and performing at local dances in the Midwest. By the time he was fourteen, he had gained a tremendous amount of musical knowledge and showmanship experience while learning to play country & western, rock n’ roll, jazz, and rhythm & blues styles on guitar. After relocating to Phoenix, Arizona with family and graduating from high school, Mark continued playing in bands and learned how to play new instruments (12-string guitar, bass guitar, Chicago “Blues Style” harmonica, percussion instruments, and uklele). He also began studying classical guitar at Arizona State University under Celine Romero of the famed “Romero Family” and graduated as a music education major from Mesa Community College in 1974. It was during this time (1970 – 1980) when Mark embarked on a new career that would forever change his life. He started teaching guitar at Milano Music in Mesa, Arizona. While maintaining a busy schedule (80 private students a week), Mark also began teaching music theory, picking techniques, and improvisation in classroom settings. Mark’s performance highlights include: lead guitarist and vocals in “The Klansmen” (Midwest rock group – early 60’s); lead guitarist and vocals in “Upper Berth” based out of Tempe, Arizona (late 60’s rock band); lead guitarist and vocals in “Gibraltar” based out of Phoenix, Arizona (70’s rock & country band). In 1974 Mark performed with “The Lawrence Welk Road Show” which consisted of some of the celebrities who were regulars on the television series including Bob Ralston and Annaconi. Mark backed up Annaconi on guitar as she sang to a sold out crowd in Mesa, Arizona. When the 90’s came, Mark realized something else he wanted to do – work with special needs children. He began his education in that field and today has a Masters Degree in Special Education with an emphasis in visual impairment and severe and profound children. Mark continues his musicianship today as a songwriter with copyrighted music and lyrics, recording studio experience, and over 30 years of teaching.